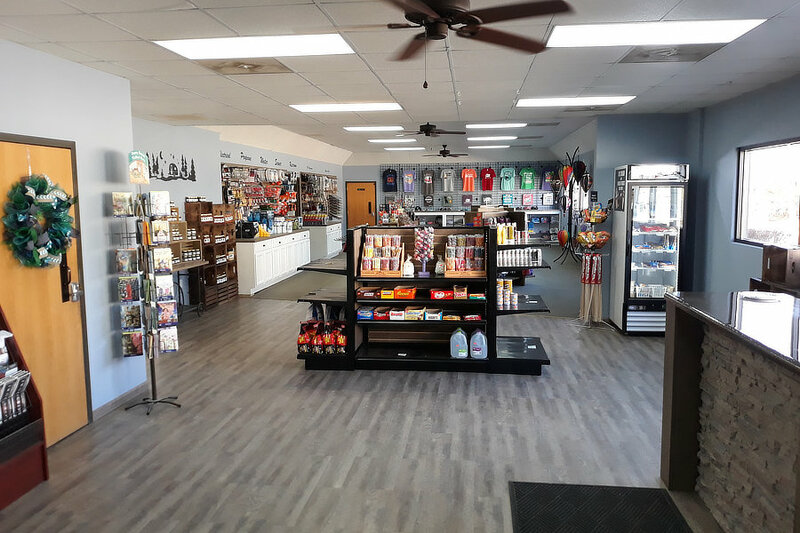 Our park features a large store and gift shop where you can find a little bit of everything you need including drinks (soda, juice, milk, beer, and wine), food (eggs, baking staples, convenience foods, snacks, candy, jams, jellies, salsas, chips and more), medicine, toiletries, RV Supplies, Camping Supplies, toys, swimming items, gifts, and more. We are proud to offer local Les Bourgeois wine, many local craft beers from Log Boat Brewing and Burr Oak Brewery. Our store also offers many Missouri made products including Fitz’s Soda, Cherry Mash, and Shakespeare’s Pizza. 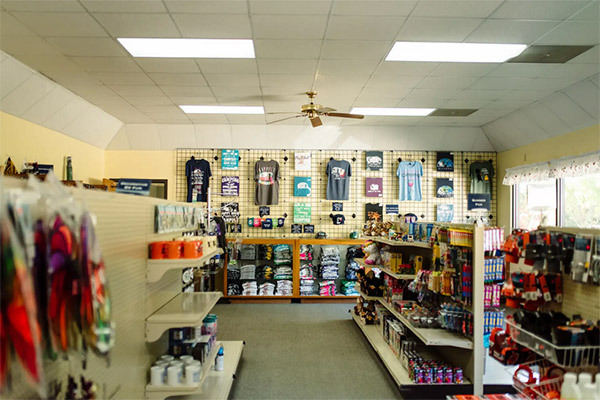 Our gift shop offers many wonderful gift choices for all ages, including clothing, ornaments, toys, signs, mugs, keychains, decorative items, and lots more. Our store also serves as our office, so if you need anything at all please be sure to pop in and say hello. 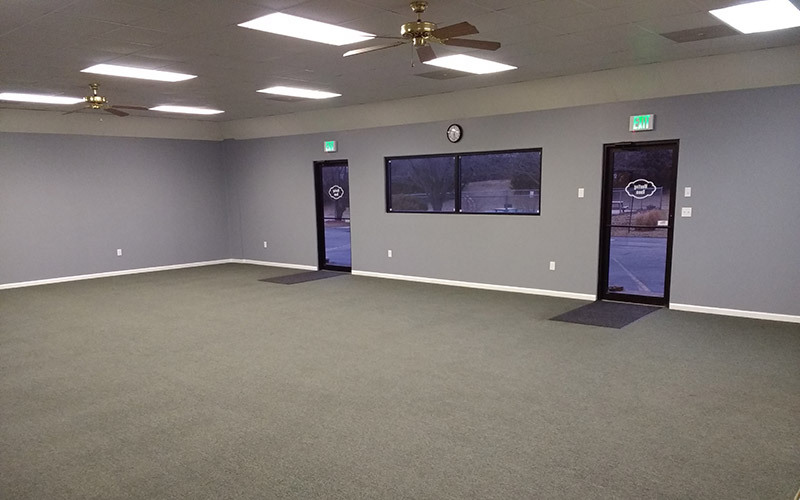 We look forward to seeing you and helping meet any needs you may have! 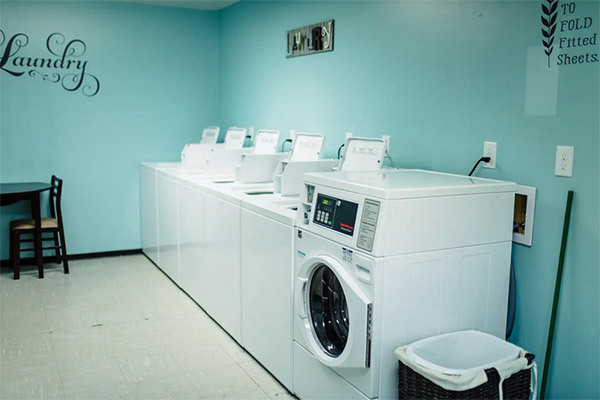 If you need to wash your laundry while you are here, you will find a newly renovated laundry room with brand new 6 new commercial washers and 6 new commercial dryers. A change machine is available for $1 and $5 denominations. 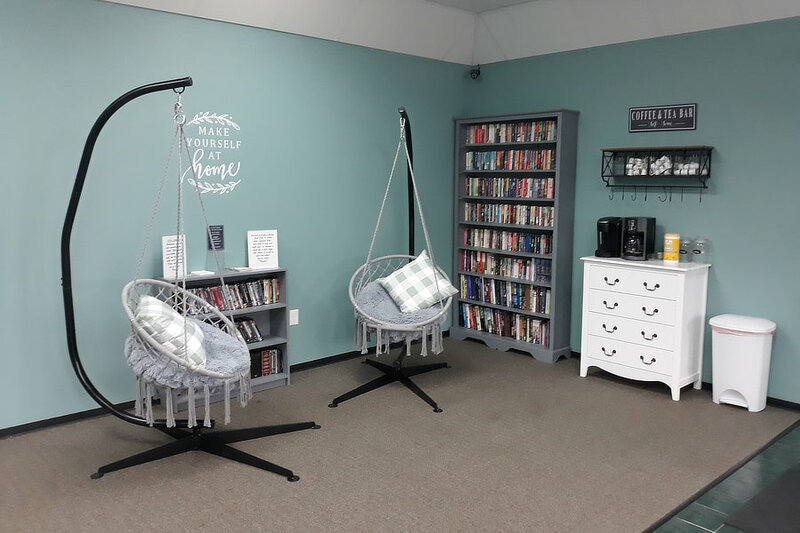 A candy machine, reading material, comfortable seating, a large folding table, and vending with snacks and drinks are also available. Our park hosts two campground restrooms with showers – one for women and one for men. Each restroom contains 3 restroom stalls (handicap accessible), and 3 shower stalls. 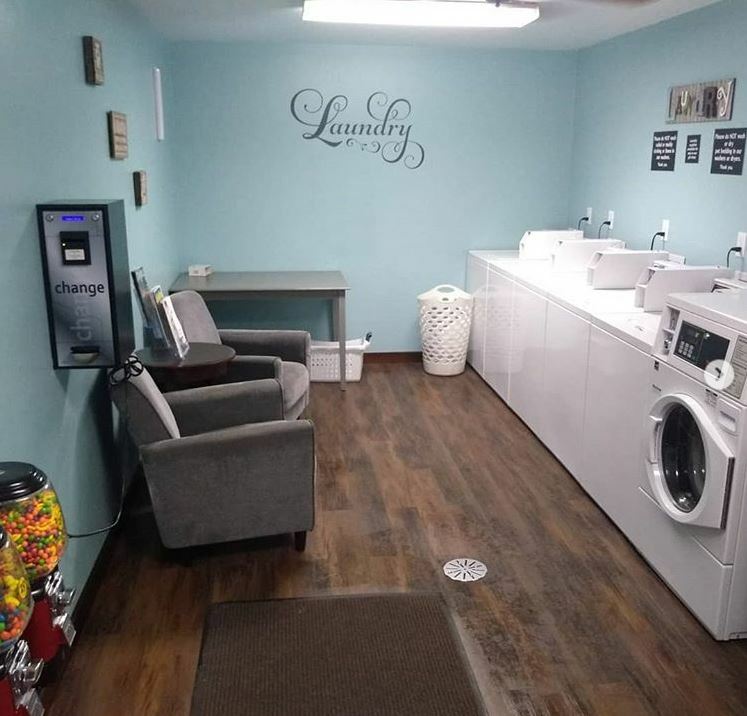 Our restrooms are open 24/7 for your convenience. 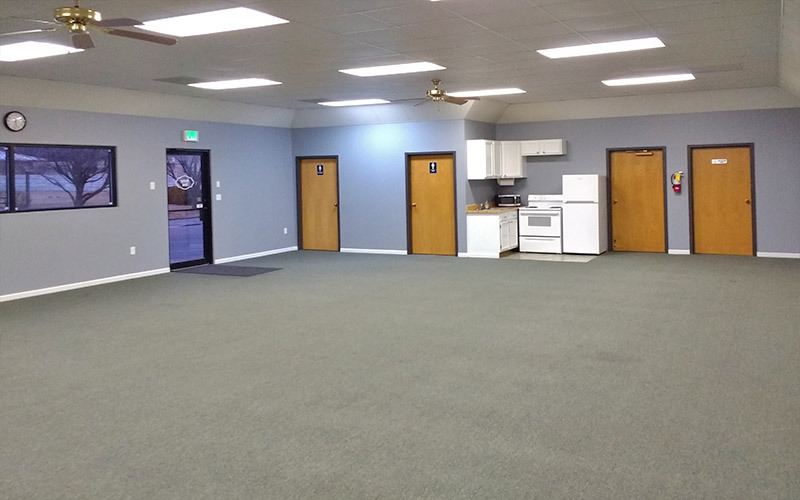 A large meeting room is available and open for campground and public use with reservations. The room contains a small kitchenette with sink, refrigerator, and stove and men and women’s restrooms. Rental of this room can include up to 12 tables and 100 chairs. There are electrical outlets located throughout the room, making it a perfect option for potlucks with slow cookers. Rental fees apply. If weather is inclement during a park planned social event, you will find the event in the meeting room if it is not rented at the time. 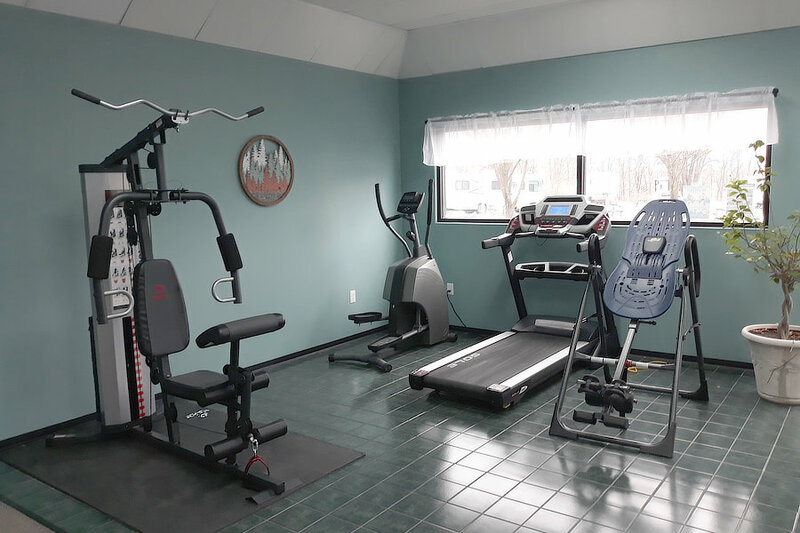 Our recreation room hosts a gym area with treadmill, elliptical machine, weight benches, yoga items, small weights, and more. Check out our DVD library for your borrowing enjoyment. No check out necessary, we work on the honor system – take one, bring it back before you check out. You are also welcome to donate any family-friendly movies that you would like. A Book Exchange is available with a large selection library with many different titles. We like to rotate our stock often, so please feel free to take a book and leave a book. 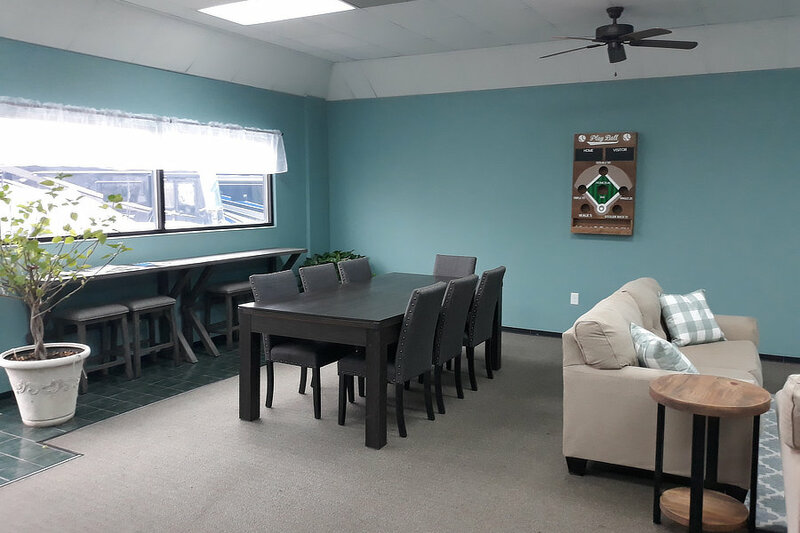 Many board games and tables are available to use in our recreation room. 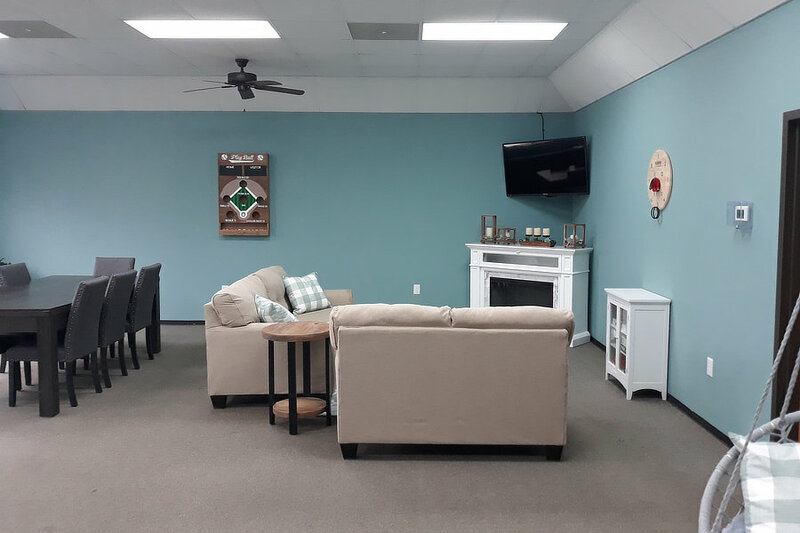 Recreation Room is for use by guests 18 or older or children accompanied by a guardian over the age of 18. The best part of camping is the down-to-earth, person-to-person experience! Join us at several planned social activities each year. We look forward to welcoming you and visiting with you. We host BBQs, potlucks, breakfast events, holiday themed events, beer tastings, glow parties, tie dye events, and more during the year. Our current schedule can be found on our activities page. During winter, we are excited to share our Christmas spirit with you. If you are looking for a spot to feel the Christmas spirit, we hope we will be your choice. Our park is decorated with lights and holiday décor beginning in November and each weekend features a Christmas themed activity such as cookie decorating, Christmas Wine & Sip events, wreath making, and more! Please be sure to check our activities page and calendar for this year’s events. Wifi is complimentary at your campsite! Internet access is available in most areas of our property. Free WiFi is including in the price of your nightly fee. Due to the limited bandwidth available to most RV Parks and Campgrounds still, please note that streaming of television, video games, or any other kind of streaming is prohibited. Our free WiFi is great for emailing, surfing the net, paying bills, etc. Important things to know: Internet speeds can vary due to the number of guests connected to the wireless network and the amount of data they are using. Please be mindful of others by monitoring your family’s use. Streaming movies (especially HD), gaming and music greatly impact the Wi-Fi experience for all guests. Signal strength can be affected by the construction materials of your RV, inclement weather, trees and nearby structures. To use our wifi: 1. Open your wireless options on your computer, phone, tablet or other device 2. Find the access point with the strongest signal (it is the one that is closest to you and will offer a the best signal for service). The option will say Cottonwoods Guest wifi. 3. Click on the access point to connect. 4. If you experience issues with connecting, if connected disconnect and please go back to your wireless utility options on your device, look for the Cottonwoods wifi access point with the strongest signal and click connect. If you are having trouble using our wifi, please follow the following steps to resolve any issues. 1. Reboot your device. 2. Try to connect again to the strongest access point with the park’s name. 3. If you are still experiencing problems, please call the office at (573) 474 – 2747. From time to time our service provider may have an outage or our system may need a reboot every once in a while. 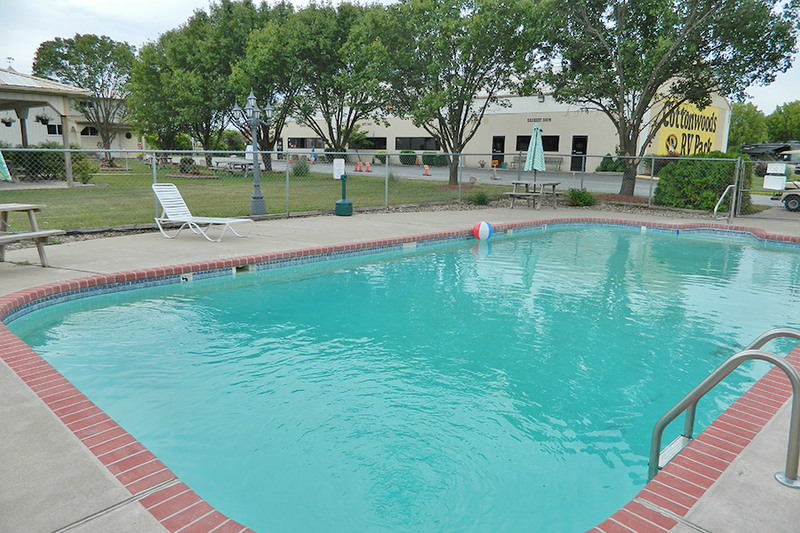 Our pool is an outdoor pool that is open seasonally May through September. If weather permits, we will often open our pool in April and continue to operate the pool through October as long as the weather is warm. The pool is open daily during these times from 8 AM until dark. Minors under 18 must be accompanied by an adult over the age of 21 at all times. No running, horseplay, or diving please. 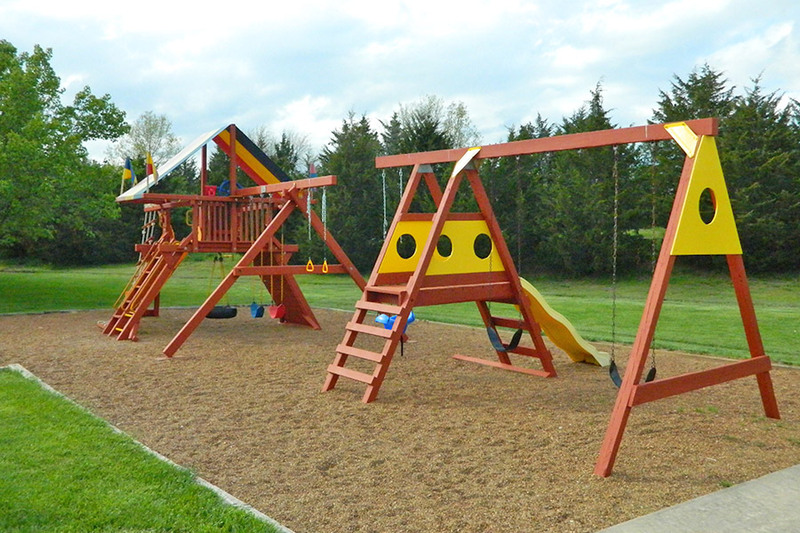 Our playground area is located next to our basketball court and pool and features a large playset with swings, slides, kid-size rock climbing wall, and more. The playground is open from 7 AM to dusk. This community area features our social activity pavilion and community firepit. Join us here for social events when the weather is nice. Sit outside at one of our picnic tables and enjoy a book on a warm sunny day. Need a quiet spot away from the RV? This are is a great choice. Are you looking for a place to grill some food on a larger grill? You are welcome to use our BBQ grills at the pavilion. Charcoal, Lighter Fluid, BBQ Sauce, Picnic supplies, and beverages are available in our store for your convenience. 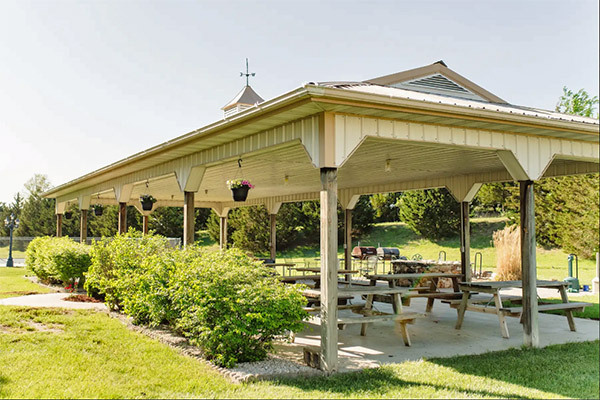 Next to this area, you will find the horseshoe pits and horseshoes are available hanging from a nail on the back side of one of the pavilion posts for your enjoyment. The central area of our park features lush landscaping and a wooden gazebo with a picnic table inside for your enjoyment. A great spot to sit and picnic, visit with friends and family, or watch the activities of the campground. 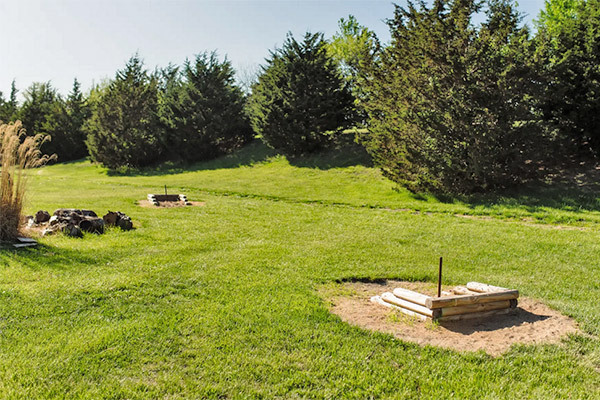 We welcome you to grab a set of horseshoes from the backside of our pavilion posts and play a round of horseshoes at our horseshoe pits located behind the pavilion. Our basketball court can be found between the playground and pool and is open from 8 AM until dark each day. Basketballs are available to use. If you would like to borrow a free basketball, please ask our store staff. We also have catcher mitts and baseballs available for playing catch. Please no batting in the park though. Basketballs and other items must be returned after you are finished with them. Please do not leave them at the basketball court. 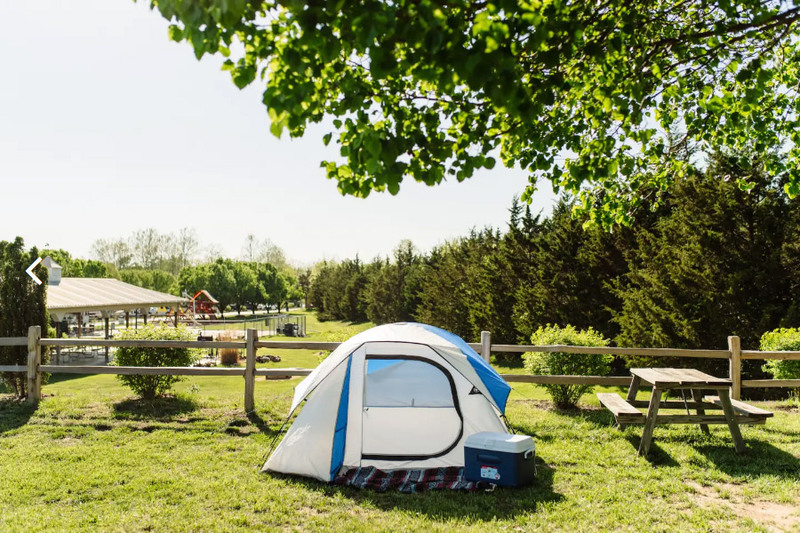 Visit our Camping Rates page for more information. Our meeting room is available for rent daily to both the public and rally groups! Are you looking for a good spot to hold your family reunion, a baby shower, or Christmas party? Look no further! 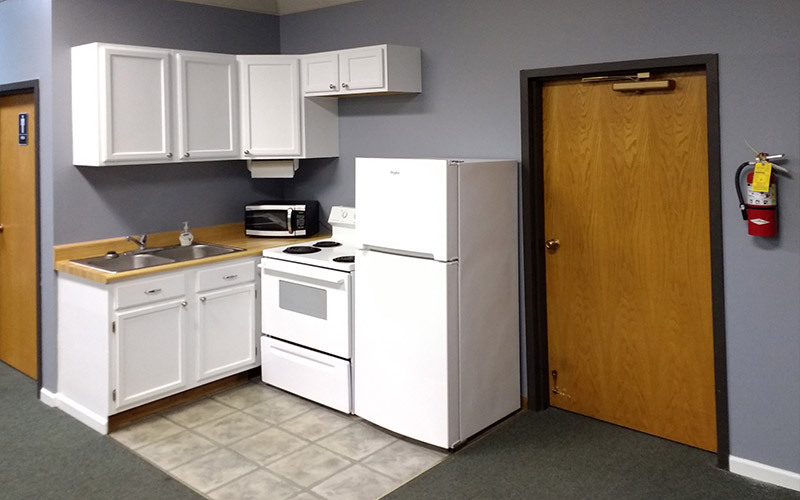 We offer a 40 foot x 25 foot Meeting Room with a kitchenette that includes a sink, stove, fridge, and microwave. The room hosts multiple outlets located throughout the room, offering great opportunities to utilize your slow cookers for group meals. 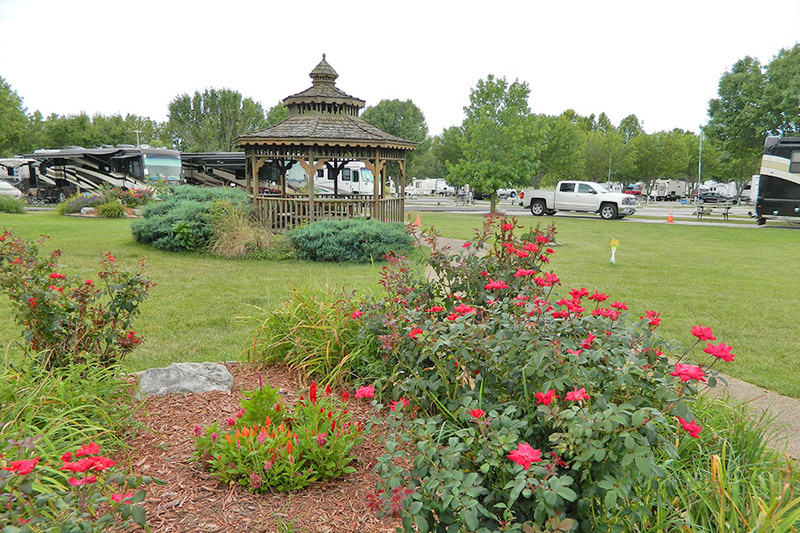 Cottonwoods RV Park Meeting Facilities are located just minutes from local dining, shopping, natural areas, and shows. We are just 20 minutes from Warm Springs Ranch – Home of the Budweiser Clydesdale’s Breeding Facility, which hosts some beautiful and inexpensive tours. Several wineries and restaurants that offer tours, tastings, and excellent food options are nearby as well. Our Meeting Room rental includes 15 large tables and 100 chairs. Rental fees begin at $50 per day for in park guests and beginning at $150+ per day for those who are not camping in our park. Rally Groups with more than 10 RVs may qualify for room discounts or free rental during their rally. It’s not camping without a camp fire, right? We’ve got you covered! We have firepits available for rent for $2 per night. 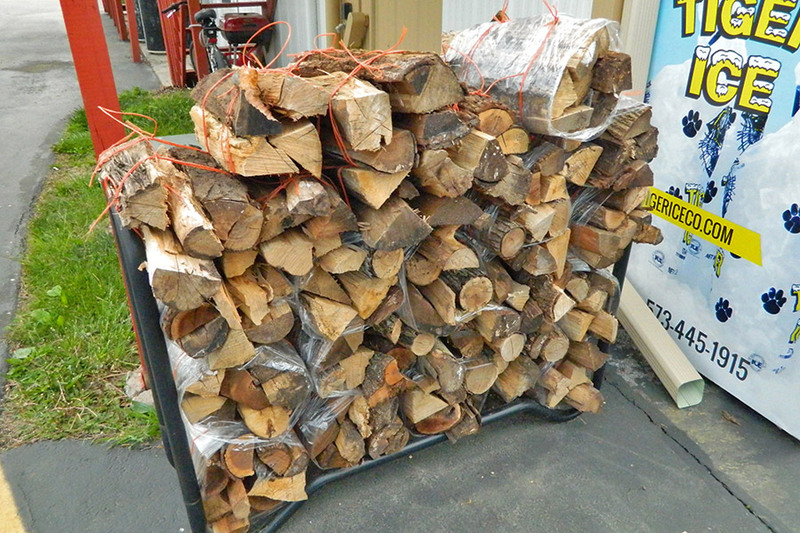 If you need wood, roasting sticks, or s’mores items, you can find these items in our store. Please note that transporting firewood into our campground is strictly prohibited due to Missouri state law. 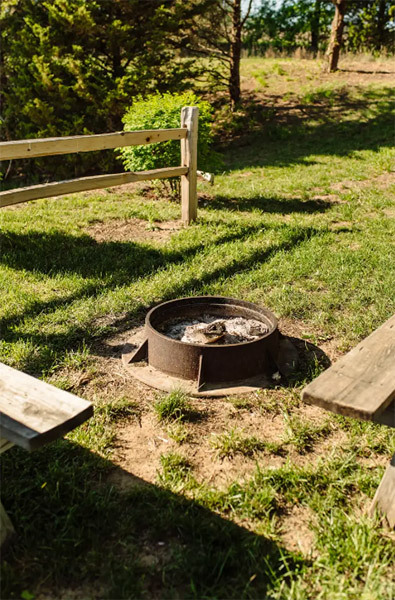 If interested in renting a firepit, please put in a request with our store and one will be delivered to your site pending payment and availability. Firepits are limited, so please place any rental requests early. You are also welcome to bring your own firepits. When using any firepit in our park, please place it over the concrete or gravel at your site as the heat from your fire can kill the grass. Before heading to bed, please make sure your fire is out and you may leave your firepit at your site when you check out and we will pick it up. Firewood is for sale in our gift shop. We are also proud to offer fire starters, roasting sticks, s’mores items, and more for your enjoyment. Please remember that Missouri law prohibits the transportation of wood and therefore wood from outside our campground is prohibited. We’re proud to be a pet-friendly park! We wanted to make things convenient for our guests while traveling, so we’ve placed complimentary Doggie Waste Pick Up bags and waste stations at both the West and East ends of our park. Please be sure to pick up after your pet during your stay and please remember your pet must be on a leash at all times. For your convenience, our park hosts a quick dump station near the main entrance/exit. For current dump fees, please check our current rates page. Basketballs, ladder golf, bean bag toss and bocce ball are available to borrow for free from our store staff. Please notify the store if you would like to borrow one of these games and we will get it ready for you to come up to the store and pick up for the day. 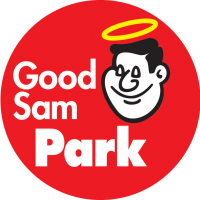 We offer LP Gas filling at our park. If you have a portable tank, we are more than happy to pick up your tank and fill it for you and deliver to our campsites. Just stop by our Main Office to sign up for delivery, call the Main Office at (573) 474-2747 to arrange delivery once you are at your site. Please note that propane delivery does not happen on Holidays, Sundays, or any days that our office is closed. Missouri State Law Requires that propane tank be no more than 10 years old and we are not allowed to fill tanks outside of this law. If your tank is older than 2009, the tank will need to be recertified. If your tank requires recertification, please contact our office and we would be happy to give you certification location information. Motorhome tanks will require our guests to pull up to our LP Filling Station for filling. 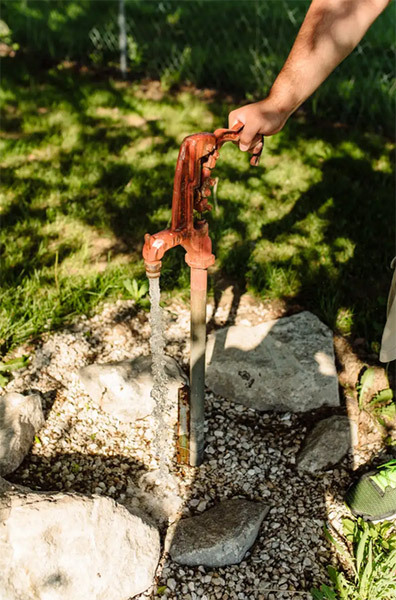 If you’re tank is located on the passenger side of your RV, you may need to back in for filling, due to Missouri Propane Laws limiting our filling hose lengths. We’re happy to assist you with guidance backing up. We are happy to offer the following information for television service information. If you are traveling with an over the air antennae, several local channels are available for your enjoyment. Cable television is not available. If traveling with your own satellite dish, please point your dish toward the back row of our park, so that it is facing the Southern sky for best television reception. Please remember that streaming is not allowed on our wifi network. Internet speeds can vary due to the number of guests connected to the wireless network and the amount of data they are using. Please be mindful of others by monitoring your family’s use. Streaming movies (especially HD), gaming and music greatly impact the Wi-Fi experience for all guests. You’ve been on the road all day and you’re hungry. Where can you get a bite to eat quick? Don’t worry, we’ve got you covered! The following options are available for food delivery service right to your site. Be sure to tell them your site number when you call or order online. We also offer snacks, Shakespeare’s, frozen sandwiches, wine, beer, and more food options in our gift shop! Grub Hub, Mr. Delivery and Uber Eats also service our park. When ordering food, please use the following address: 5170 N Oakland Gravel Road, Columbia, MO 65202. 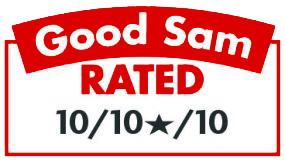 We are happy to report that we are lucky to have a wonderful local Mobile RV Repair Service who comes out and looks at and can often fix your RV on site in our park. If you are needing assistance with a repair, please contact Commercial Truck & RV Repair at (573) 474 – 0621. Be sure to tell them Cottonwoods recommended that you give them a call!